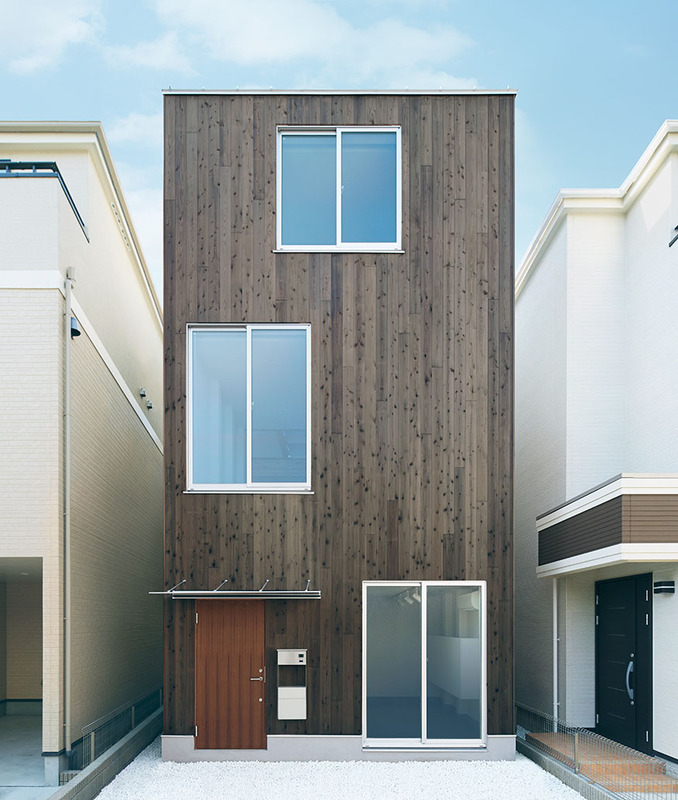 Japanese consumer goods retail company Muji has gone from selling household products and furniture to selling the entire house in a prefabricated-pack. The good news is that you don’t have to assemble it yourself like a DIY IKEA furniture. The company will install it for you if you live in Japan. 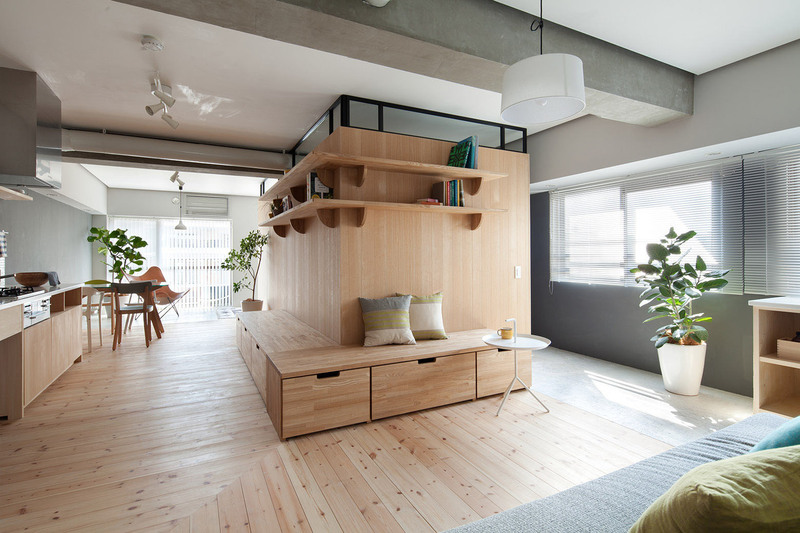 This small modern apartment in Yokohama, Japan designed by Sinato uses a multifunctional central wooden unit to serve as a partition wall between the living area and the sleeping area. 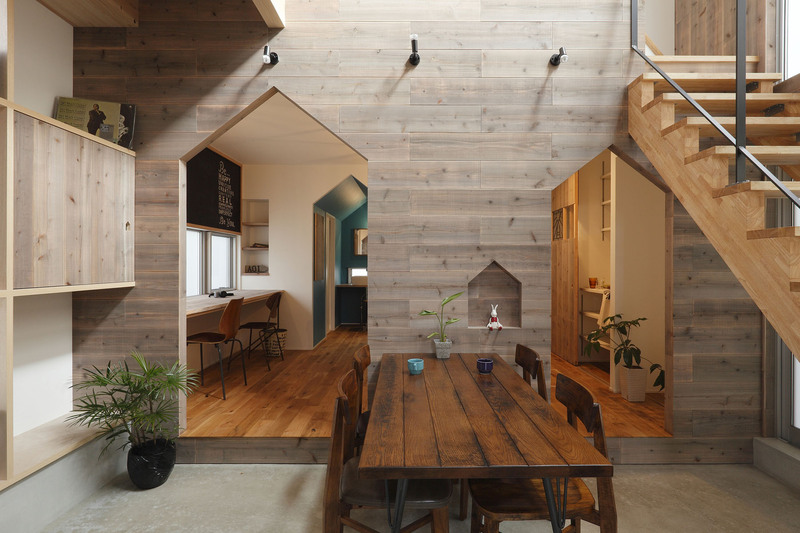 Hazukashi House in Kyoto, Japan designed by ALTS Design Office is planned around a concept of providing light for the home on a small lot. 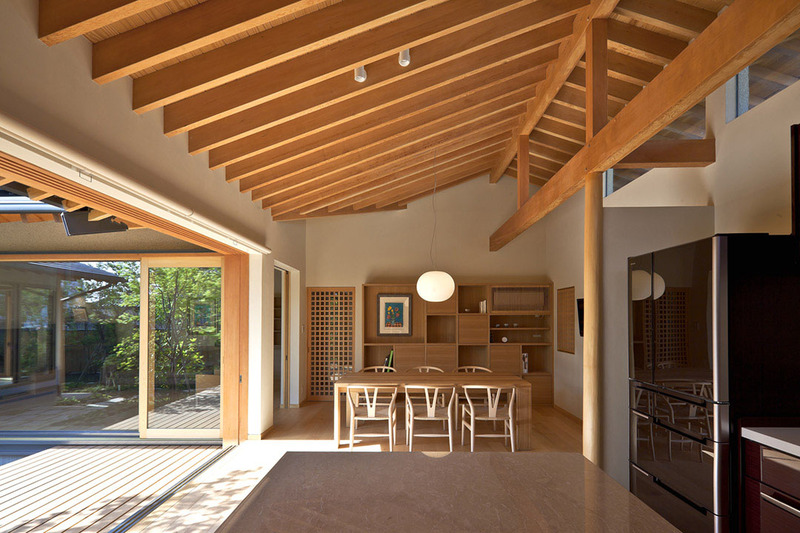 Architect Takashi Okuno designed this sprawling home named House of Nagahama in Ehime Prefecture, Japan with emphasis on privacy and tranquility. The plan has five separate gardens and terraces which are accessed via different rooms. 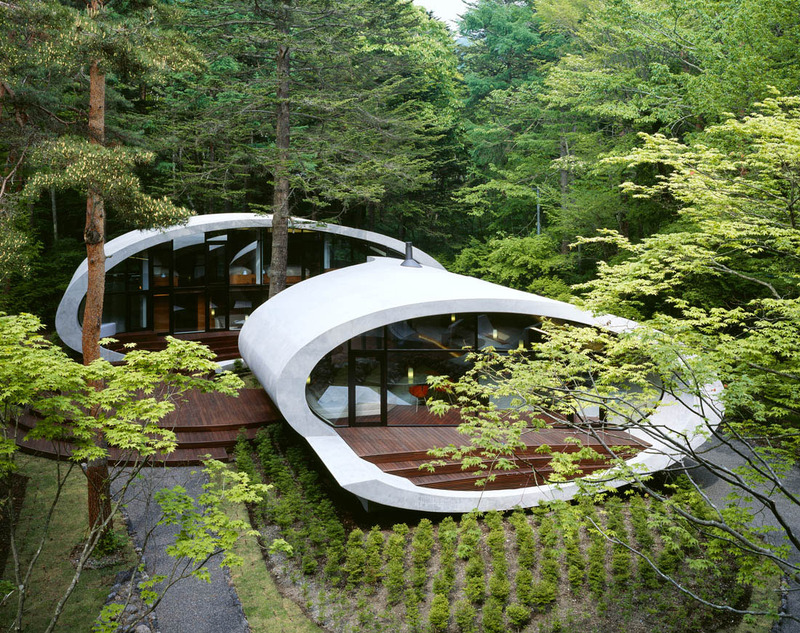 Shell House Villa is located in the Karuizawa region of Kitasaku, Nagano, Japan. Designed by architecture firm ARTechnic, the concrete villa with a large oval shell shaped structure is built in the middle of the forest. The structure appears to float above the ground like a spacecraft, with trees growing around it, harmonizing the villa into the landscape. 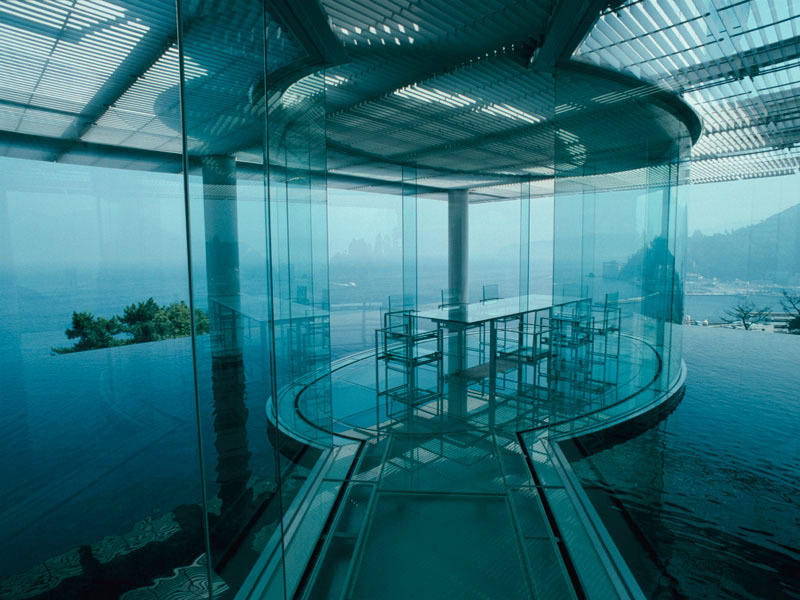 Situated on a hill overlooking Atami, Japan southwest of Tokyo, this spectacular ocean view villa has a striking oval dinning room that appears to be on an island surrounded by water. Designed by architect Kengo Kuma, this glass house in which water is also a key component has the effect of a structure floating on water. The oval dinning room is connected to the rest of the house by a glass corridor. The infinity-edge reflecting pool connects the house to the ocean and the coastline. 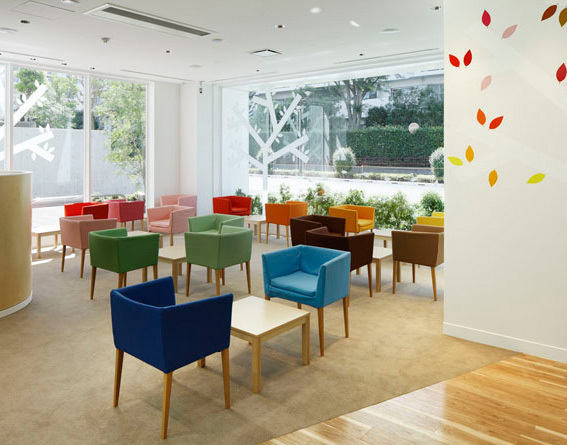 The architecture and interior design of the Sugamo Shinkin Bank in Tokiwadai, Tokyo, Japan sought to create a relaxing and refreshing space for customers. 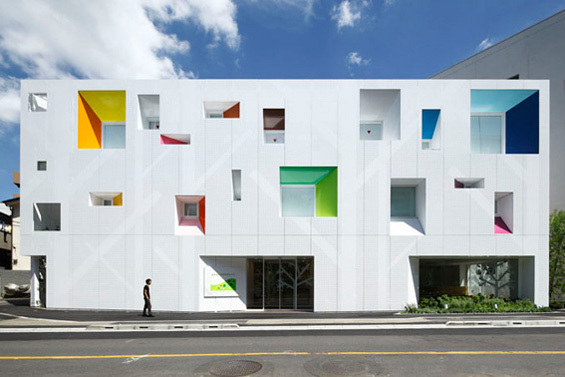 Architect Emmanuelle Moureaux arranged 14 different colours in a distinctive rhythmical pattern for the windows of the building, and designed silhouettes of trees for the façade. A constellation of leaves in 24 different colours are painted on the interior walls and glass windows, blending with the real trees in the courtyards.